Can you imagine being in a part of your town that you’ve never been before. You have no idea where to go or what to do. So you do what a lot of people do when they don’t know where they’re going. They pull out their phone or ask someone else to check out what Google maps has to say about where to go. But what if you never got help from Google maps? What if you didn’t trust it’s directions? What if you decided you know more than the map and decide to go your own way. Well, unless you’re really lucky, you’d probably get lost without help and direction. That’s a lot like what this Bible verse is saying. It’s telling us to not think that we’re wise. We shouldn’t think that we can make decisions independently of God. Yet many times that’s what we do. We don’t get God’s help on our decision making. We don’t include God in our lives. We don’t run after Him and turn away from the things that keep us from Him. So challenge yourself today to turn away from things that keep you from God. 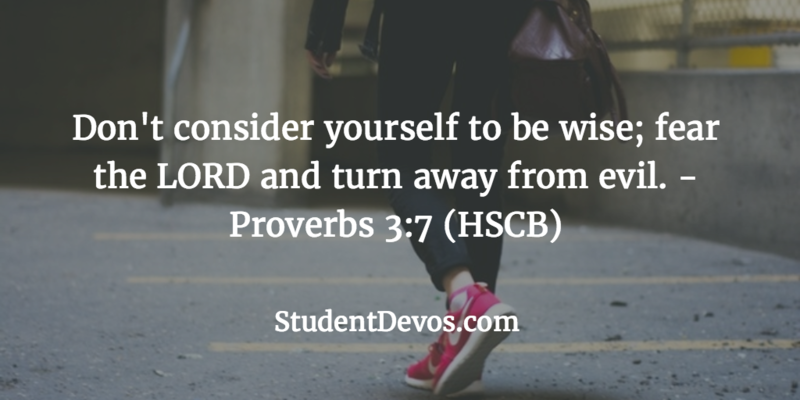 Turn away from things that are bad and decide instead to run after God. Get His input and direction for your life. Choose to make Him your priority in life.